MacDailyNews Take: Thanks to Apple. Period. 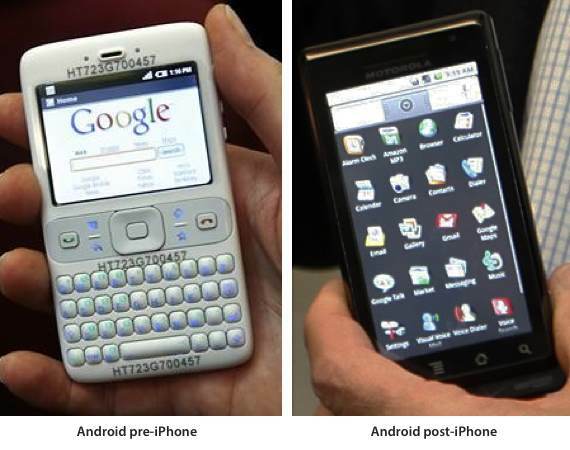 Samsung just followed Apple’s lead as usual and failed. As usual. MacDailyNews Take: Other manufacturers followed Apple’s lead as always and failed. As always. $1000 for iPhone, sure but Android? Come on. No. Dingle’s dongle dangled dung, densely. Dingaling “Deng Xiao Ping” dangled Dingler’s Dong, dude. D’oh! Outrageous pricing, Apple. Was hoping you would LOWER PRICES, as an incentive to get more people in the ecosystem as services income rises. But no, it’s all about the money nowadays. What you charge for storage and ram borders on criminal greed when it costs more than a computer and third party products. GeoB, I agree that the surcharge for storage is ridiculous; cost and convenience is why both of us would prefer an iPhone SE2 to any of the current range. Still, I’m not convinced that basic iPhones are like razors or printers—something you can sell below cost to hook customers into buying consumables. On a personal note, since you are no longer an Apple customer, I guess you won’t be posting here anymore. Godspeed! There you go again, Minister of Misinformation falsely extrapolating my post instead of taking it on face value. Pricing: I said, “Was hoping you would LOWER PRICES” I did not say selling below cost and losing money, I did not say selling AT cost. What I did not spell out because thought it was obvious to those that know how business works — reduce profit margins. 10% would be ideal for the first trillion dollar company on a limited time basis like a back to school special. Realistically though, Apple could easily reduce margins upwards to 50% and not skip a beat. But now that Apple turned into a money machine green with greed, not going to happen. Wrong and more wrong, your modus operandi. I just bought a brand new SE when they were discontinued at enormous savings. Now have one as a backup. Apple customer consistently since 1982, so dream on, my posts will most definitely continue. Glad your disappointed. Given that you “simply won’t pay it, EVER” I assume that you are not an owner or user of Apple products. If so, why are you posting comments on an Apple fan site? It’s hard to figure Apple’s total business strategy, but it seems to revolve about maximum revenue and profits. It’s your choice not to pay but you’re just one individual out of tens of millions of Apple product purchasers so you don’t carry very much weight. Correct, but I’m not interviewing for Apple CEO or running for U.S. president. Simply a devoted customer and constructive critic whichever is required at the time. Sooooooo, it’s either about the money (services income) OR it’s about the money (higher priced phones). Got it. Nothing new here. People want the quality and cachet of Snap-on tools at a Harbor Freight price. I think the consumer should pay Apple the money and keep the device longer. That seems like a fair enough trade-off for an Apple product. I really don’t understand all the griping. No one is being forced to buy Apple products. Either buy it or don’t. Whining won’t change Apple’s business strategy as long as the strategy remains profitable. As Apple continues to lose smartphone market share maybe they’ll lower iPhone prices. It’s difficult for me to envision that happening, but you never know. Apple appears to be an inflexible company and will likely break before it bends. I think once a company becomes known as a premium brand, they can’t turn back by cutting prices. They’ll continually have to find new ways to justify higher pricing. With my new iPhone XS Max, with 500GB storage, I think I’ve found my ideal iPod that I’ll have for quite some time. Always wanted a device to have all my music available where ever I wanted it. The fact that Apple as of very recently is no longer reporting product sales numbers immediately after mixed reports of weak XR demand, projected to be their best seller, SPEAKS VOLUMES. The main thrust of my post (above) is IF services are the projected main growth engine for the next few years, why not lower iPhone prices NOW and get out in front. More people in the ecosystem buying phones and services and make up for the reduced iPhone revenue by selling volumes of BOTH. Apple is changing from reporting unit sales because they are closing in on 1.5 billion customers and that means unit sales HAVE to slow down. The same rate of growth cannot continue. It isn’t possible. Unless you think every person on the planet will own an iPhone a few years from now. Apple will continue to grow their customer base and revenue will continue to grow. As Peter Drucker said, the purpose of business is to create and keep a customer. Apple understands this. I hope you understand that unit sales can decline dramatically and yet the customer base can increase at the same time. Unit sales has always been a dumb way to understand what Apple is doing. Wall Street and most other analysts never figured this out so Apple has to show them a better way to look at Apple. Even with Apple showing them it’s going to take a couple years before anyone clues in. Interesting analogy but I don’t think it fits, I think a better one is private parking. If you fill all the slots in a high density area there is little room to grow, but you can increase prices and people will stick because it’s in a great area. If you own the storefronts around the parking lot you now can direct people to these stores that supplement the fact that your parking lot doesn’t have room to grow. You’re not seeing a decline in that people are leaving the parking lot, it’s more that you have supplied all demand, but since you own the whole infrastructure you can direct demand somewhere else, which is where apple services lands. Other devices in Apple’s ecosystems are like landmarks that pique people’s interest and cause them to visit/stay. If a movie theatre sells out tickets to a given movie for many months and the ticket sales slow then the theatre is selling less tickets but new people are continuing to see the movie thus adding to the total number of people who have seen the movie. The customer base still grows even as ticket sales slow. Understand? To follow up with some math to help you understand. If Apple sells 300 million iPhones this year and 50 million are new iPhone customers that increases the customer base. If next year Apple sells 200 million iPhones and 30 million are new iPhone customers then iPhone sales have decreased dramatically and yet the customer base has still grown because iPhone customers tend to stay as Apple customers at an incredibly high rate. This has to happen. Apple cannot sell an iPhone to every single person on the planet which is what would have to happen to sustain previously very high rates of growth. Unit sales must decrease but any sales at all will include new customers and that adds to the customer base. Providing that Apple customer remain highly satisfied, and griping or whining on tech site comments aside, there is no evidence of Apple customer satisfaction being in jeopardy.